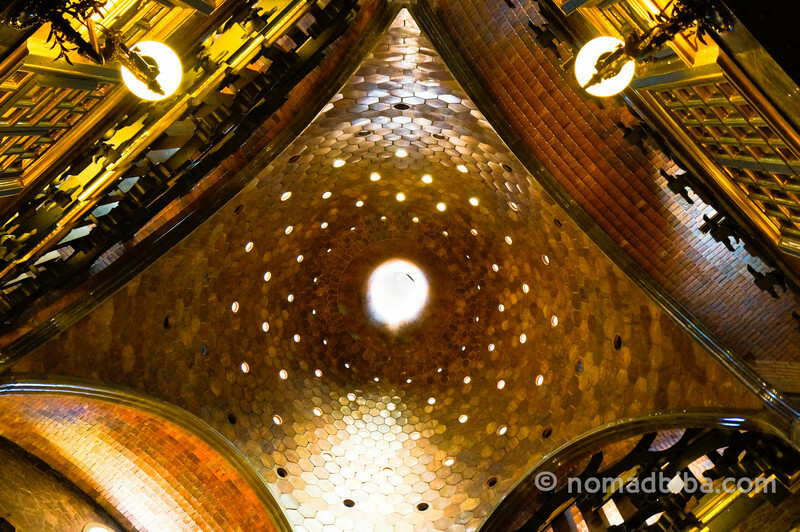 Back in 2004 when I moved to Barcelona, the Palau Guell was closed due to renovations. In 2008, it was partially opened to the public; but the roof section continued to be closed. It was unfortunate for me because what I wanted to see most were its iconic chimneys covered in mosaics (I love mosaics! ); so I continued to wait. Renovations were finally completed in April 2011 and the whole building was once again open. When I went back to Barcelona, I made sure to visit this beautiful mansion designed by Antoni Gaudí; one of the few projects of his that I hadn’t seen yet. The house used to be the residence of the Güell family from the late 19th century to the early 20th century. Eusebi Güell, a wealthy industrialist and Catalan politician, was the main patron of Antoni Gaudí’s work. They collaborated closely in many projects and the Palau Güell, which was built from 1886 – 1890, was one of their first works together. From the narrow streets of El Raval, it’s almost impossible to see the whole palace and get a good idea of how imposing it really is. As in many of Gaudí’s work, the Palau Guell is a remarkable construction because of the innovative use of space and light in the building. 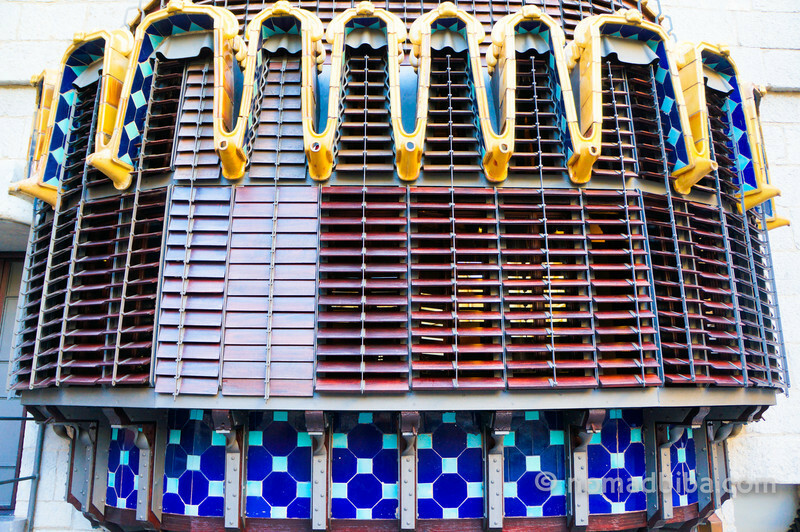 Gaudí mixed a variety of materials, such as wrought iron, glass, ceramics, stone and wood. He also combined traditional building techniques in ingenious ways. The Palau Güell was designated by the UNESCO as a World Heritage site in 1984. Visits start from the basement, in what used to be the stables; they were built in bare stone and have an austere feel. As we move up the different levels of the mansion, the style becomes more stunning and richer in details. 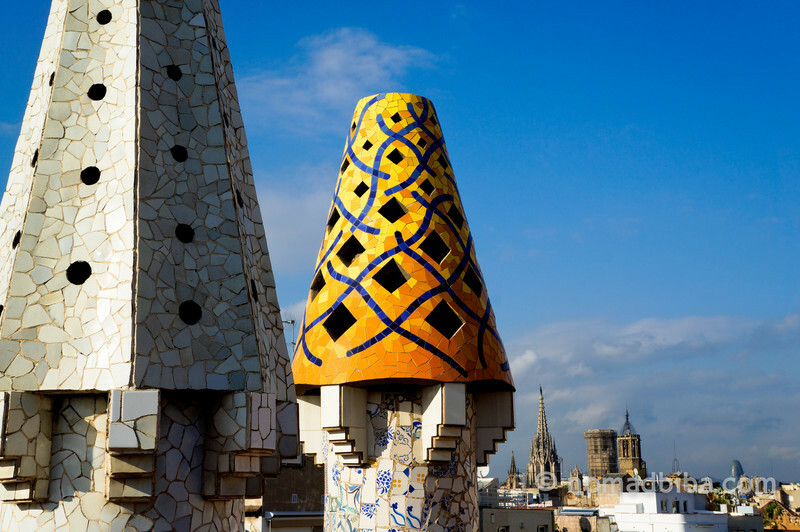 On the rooftop, there’s a collection of chimneys all different from each other and covered in colourful mosaics. They have become the iconic symbol of the Güell Palace. Since the palace was closed for many years, there are still many visitors who skip this site in favour of other Gaudí buildings. When I visited, there was hardly any line up and not that many people inside; a big contrast to other sites like La Pedrera o Casa Batlló. If you’re a fan of Gaudí’s work or you like seeing great architecture when you travel, you shouldn’t miss the Palau Guell. For information about opening hours and rates, visit the official website. Have you visited any of Antoni Gaudí’s works? Which one is your favourite? Let me know in the comments below! One of the main reasons I want to visit Barcelona is to immerse myself in Gaudi’s work…this is simply beautiful! Gaudí was such a genius, so ahead of his time. I really like his work. If I had to pick a favourite building, I think I’d chose the Casa Batlló. I hope you get to visit Barcelona soon, Charu! You’d love it!